Women with advanced (metastatic) breast cancer have special needs and challenges to face. Each year in Australia approximately 13,000 women are diagnosed with breast cancer and about 3000 women die of this disease. In Queensland, it is estimated that about 3000 women are diagnosed with secondary breast cancer and about 500 die.The exact number of women who are diagnosed or are living with secondary breast cancer is not known as Cancer Registries do not capture this information in every State. An unknown number of women are diagnosed with or develop advanced breast cancer each year. Diagnosis of advanced breast cancer generally comes as a shock and compels women to further review their priorities in life. 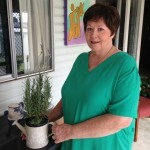 The Advanced Breast Cancer Group is a unique service that offers women all over Queensland an opportunity to meet and talk with other women. Those who join usually say that they would like to know how other women manage – manage the illness, the treatment, the decisions, and many other questions about living with the disease. This group provides the time and the space to do this. It also provides an opportunity to make strong and lasting friendships which nourish and support members of the group through what is often described as a roller-coaster ride. It is a safe place where people can talk about their worries without the fear of burdening others. They can talk together, cry, laugh and have fun together, feel understood, and less invisible than they may otherwise feel.